Picked up my new engine! Discussion in 'Maverick/Comet Projects' started by bluto, Aug 19, 2018. Just got my engine from the machine shop and I am putting it in a 1966 Mercury Comet Cyclone. BBMS18, JoeB and RMiller like this. Outstanding! Your '66 will be a crowd pleaser. A Boss 9 is one of best looking engines ever. Thanks for your comments. The other thing is the fact that this Jon Kaase motor is a 460 Boss 9 stroked to 572ci putting out 0ver 900hp. It is not going to be a drag car but a cruiser/sleeper. My little Maverick needs a heart like that! Boss's are cool. 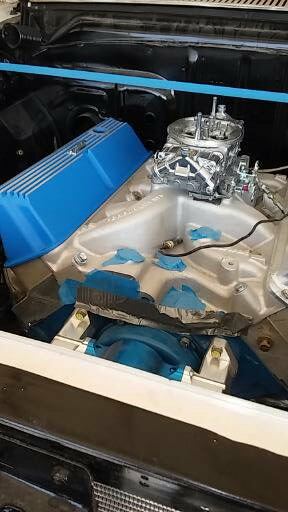 For those looking to be different.. what about putting some hemi-style boss heads on a Windsor based small block? The other thing is the fact that this Jon Kaase motor is a 460 Boss 9 stroked to 572ci putting out 0ver 900hp. I think that would scare the life out of me.... wow. Looks awesome too. The other thing is the fact that this Jon Kaase motor is a 460 Boss 9 stroked to 572ci putting out 0ver 900hp. It is not going to be a drag car but a cruiser/sleeper. It’ll only be a “sleeper” until you start it and THUNDER spews from the tailpipes. Hotrock, mojo and BBMS18 like this. That's an awesome Falcon to!!! Very nice. everything work . Then got the whole setup ceramic coated . Anything you have to do will be WORTH the effort when it's completed. : ) .